2019 blank and printable PDF Calendars with EU/UK defaults. Monthly, Yearly and Weekly calendar formats available. Ideal for use as a school calendar, church calendar, personal planner, scheduling reference, etc. All calendar templates are free, blank, and printable! 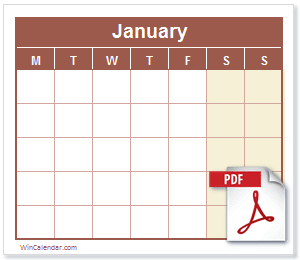 Monthly Calendar download in PDF format. For PDF calendars for the next year see:2020 Calendar, 2021 Calendar. Display Holidays for up to 17 countries including: Australia, Canada, France, Great Britain, New Zealand, Spain & South Africa. Import Microsoft Outlook Calendar, Google Calendar & Yahoo Calendar data.